That’s why it’s really important to teach our children strategies to feel positive, even in the midst of negative situations. 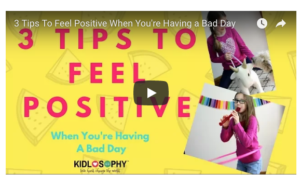 In our Kidlosophy video, Mo and Gigi offer 3 tips to help children feel positive when they’re having bad days. These strategies could actually be done daily and not reserved just for bad days. In fact, the more often children (and the adults who love them) do these three things, the fewer bad days there may be. Being grateful for what you have and who you are is a fundamental practice in our home. I believe in the power of gratitude to override a multitude of negative feelings like jealousy, resentment or feeling sorry for oneself. It lifts you up when you recognize the beauty surrounding you. When you’re grateful for such things as the sun, the stars, the trees and the reflection in the mirror, you shift from a lack to an abundance mentality. According to Psychology Today, “Numerous studies have shown that receiving, giving, or even witnessing acts of kindness increases immunity and the production of serotonin, a neurotransmitter that regulates mood in the brain.” When siblings readily share with one another and play joyfully together the entire family dynamic feels more positive. It doesn’t happen all of the time, but when it does, everyone benefits! Mo likes to say moving your body gives you, “Positive power!” Spend any amount of time with children hula hooping, riding bikes or dancing, and you’ll feel the positive energy coming from them. For me personally, I always feel better after a walk. Sometimes I need a gentle nudge to take action and move. But for my children, I’ve found merely suggesting a bike ride translates to a mad dash to the helmets and out the door they go! Bad days do happen and consistently applying these 3 tips will help. How do I know? I relied on these strategies not only for myself, but for my daughter, Mo, when she was bullied. There were a string of bad days and let me tell you, it wasn’t easy to remain positive. But after six months of practicing these strategies and making them a part of our daily routine, not only did Mo survive the bullying, but she began to thrive again. Let us know what you think about these tips by leaving a comment below. And as always, thank you for watching!